I posted my first Frugal Market Finds here, and it somehow triggered me to do more of that. So I am sharing you today another dose of my frugality, or whatever it is called. 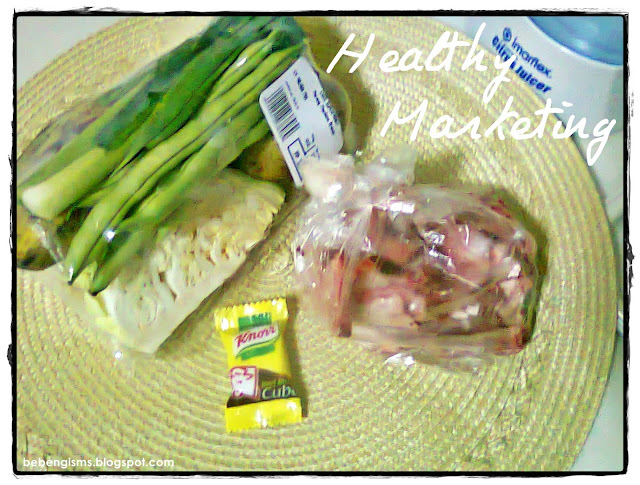 I bought the nilaga pack in Ever Supermarket in Parang, Marikina City. One of the store's staff was just stocking it up on the shelf, so I assumed it was still fresh. And yes, it is. I got the least expensive pack as it's just me and my little girl at home. I inspected, scrutinized and thought hard about each of its content before finally buying it. What's inside the nilaga pack? And it only costs Php 38.48! I mean, wow right? It has enough everything for my 1/4 kilo of pork soup pack. I bought the buto-buto for Php 19 only. They were selling it for Php 80 a kilo and looks fresh, too. No green/blue bruises (which means it's not frozen) and the blood still smells fresh. I know blood doesn't smell good, but it shouldn't stink when you're buying livestock products. I am now cooking it for our late lunch. I'm pretty sure my preschooler will only eat some meat, potato and saba. But the soup is healthy enough when sipped or poured in the rice. So that's okay. I hope you'll try this, too, mama!